Meine neun liebsten Bildbände drehen sich größtenteils um Einrichtungsthemen. Daher perfekt, wenn ihr zu Hause ein wenig umgestalten möchtet. Sie zeigen viele unterschiedliche Stile und auch, wie ihr sie für euch umsetzen könnt. Und dann habe ich noch ein paar Bücher in den Mix geworfen, die pure Augenweiden sind. 1. Design Sponge at Home vereint die schönsten Hausbesuche und DIY-Ideen des Blogs und wartet mit ein paar Extras auf. Ich bin dieses Buch etwa eine Million Mal durchgegangen. 2. Styled von Emily Henderson ist das heiß ersehnte Buch der besten Einrichtungs-Expertin der Welt (meiner Meinung nach). In dem Buch könnt ihr per Test herausfinden, welcher Stil zu euch passt und auch gleich sehen, wie ihr diesen umsetzen könnt. 3. Dominos Book of Decorating zeigt euch einige der schönsten Wohnungen, die ihr je gesehen habt. Zusätzlich bricht das Buch den Design-Prozess herunter und zeigt, wie man zu diesen wunderschönen Ergebnissen kommt. Ich habe dieses Buch eingesetzt, um Räume zu Hause umzugestalten (z.B. hier und hier). 4. See San Francisco von einer meiner liebsten Bloggerinnen, Visctoria Smith, ist ein Fest für die Augen. Und gefährlich noch dazu - man möchte sofort alles stehen und liegen lassen und das nächste Flugzeug nach San Francisco besteigen. Ich musste mich auch schon zurückhalten, nicht einzelne Bilder auszuschneiden und zu rahmen. 5. etc. von Sibella Court ist ein gedrucktes Kabinett der Kuriositäten. Ihre reichen Sammlungen an Stoffen, Muscheln, antiken Löffeln und vielem anderen werden euch für Stunden fesseln. Das Buch gibt es übrigens auch auf Deutsch. 6. Things We Love des New Yorker Modelabels Kate Spade wird euren Puls beschleunigen. Es strotzt nur so vor bunten, lebendigen Bildern, die sofortige Inspiration garantieren - für ungefähr alles. 7. Das Cocktail-Buch der Süddeutschen Zeitung habe ich vielleicht drei Mal für Rezepte verwendet. Aber es schon etwa hundert Mal durchgeblättert, bewundert, gestreichelt - ja, zwischen uns läuft was. Es ist einfach unglaublich schön und sehr außergewöhnlich gestaltet. 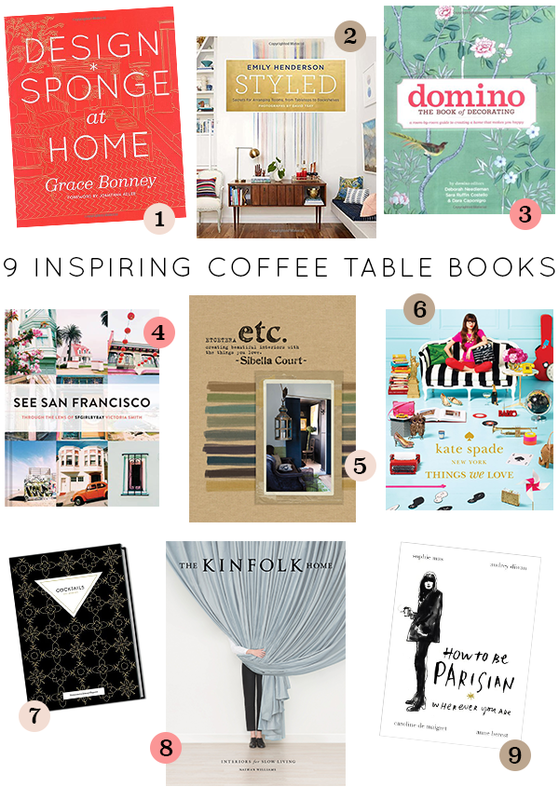 My nine favorite coffee table books are mostly about interior design and perfect if you would like to switch up your home decor. You'll see a lot of different styles in these and ways to make them work for you. And then I threw some pure eye candy into the mix for you. 1. Design Sponge at Home is a collection of the best home tours and DIYs of the blog plus some extras. I went through this probably a million times. 2. Styled by Emily Henderson is the long awaited book by the world's best interior designer (if you ask me). 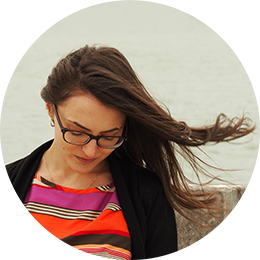 In the book she helps you find your personal interior style and shows you a bazillion ways to implement it. 3. Domino's Book of Decorating is a collection of some of the most amazing homes you will ever have seen. And it breaks down the process to show you how people got there. I used this book to redesign rooms in our home (see here and here). 4. See San Francisco by one of my favorite bloggers Victoria Smith is a feast for the eyes and makes you want to board the next plane to San Fran right away. More than once I've also been tempted to cut out some of the images to frame them. 5. etc. by Sibella Court is like a printed cabinet of curiosities. She has a collector's view on decorating. Thus the book is full to the brim of the most beautiful collections of fabric, shells, antique spoons and many more. You will lose yourself in this for hours, so beware. 6. Things We Love by fashion brand Kate Spade will make your heart beat faster. It's probably the most sophisticated scrap book of awesome image pairings you will find out there. Flip through this for instant inspiration - for anything really. 7. This cocktail book is only available in German but the design of it is so unbelievably beautiful, get it anyway. It's a gem of a book. I've only tried three of the cocktails in it as I prefer looking at it, touching it, caressing it. Yes, we have a thing together. 8. Kinfolk Home invites you into the homes of creatives all over the world. You'll see tiny homes and huge mansions, all styled elaborately no matter their size. 9. How to Be Parisian is like flipping through a diary, one with intimate photographs, witty illustrations and even wittier stories. This is a true feel-good, tongue-in-cheek and chuckle book. Get it. Hinweis: In diesem Post befinden sich Amazon Affiliate Links. Vielen Dank für eure Unterstützung. / Note: This post contains Amazon affiliate links. Thank you for your support.